Swine Flu is a group of influenza viruses that regularly cause influenza in pigs. Usually infections in humans are uncommon. However, this present series of outbreaks of human cases of of swine flu has been linked to a new, previously unknown strain of H1N1 virus that seems to be able to spread from human-to-human. Hence, this sudden and fast spread around the world. The symptoms of swine flu in humans include high fever, tiredness, sore throat , coughing nausea and vomiting and even diarrhoea. Human-to-human transmission of flu viruses can occur by “droplet” spread - when an infectious individual coughs, sneezes, talks or has hand-to-hand contact with an infected person (e.g. handshake). It can also spread if individuals touch surfaces that are contaminated with the flu virus and then touch their nose or mouth. Swine flu viruses cannot be transmitted by food. The virus does respond to the newer antiviral medications oseltamivir (Tamiflu) and zanamivir (Relenza). The seasonal influenza vaccination does not provide protection against the swine flu. Swine flu is a group of influenza viruses that causes flu in pigs. Usually infections in humans are uncommon. Early symptoms are similar to seasonal flu - cough, sore throat, high fever, headache, runny nose, general fatigue, and muscle pains. Vomiting and diarrhea have also been noted..
How is this swine flu spreading? It is most likely spreading from person to person through infectious respiratory droplets (droplets generated when a person coughs, sneezes or talks) and hand-to-hand contact. How can I prevent getting it? 1. Personal hygiene is critical. Wash your hands frequently, especially after using the bathroom and before eating or drinking. 2. Avoid touching your nose, mouth and eyes. 3. Avoid coming in close contact with persons who have flu symptoms. How can I prevent its spread? Respiratory etiquette is important. If you need to cough or sneeze, cover your mouth with a tissue, mask, or hand. Avoid public areas such as markets or theaters if you have respiratory symptoms and fever. If you have a fever (greater than 100°F or 37.8°C) with symptoms as above it is advisable that you consult your physician. What is the infectious period? Is there a vaccine to prevent swine flu? There is no specific vaccine against this swine flu. 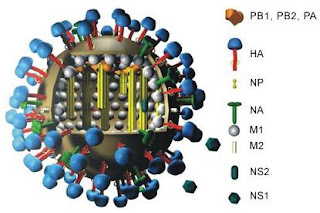 Can swine flu be treated with antiviral medications? Preliminary information indicates that the virus is sensitive to the newer antiviral medications oseltamivir (Tamiflu) and zanamivir (Relenza). It is resistant to the older medications amantadine and rimantidine. Can I catch swine flu from eating pork or pork products? Can I travel to Mexico? There are travel restrictions in place. Check GE’s travel intranet site for updates. If you are required to undertake business critical travel, please consult your manager and follow the procedure laid down for such travel. As for non-essential travel, it might be prudent to put it off for the time being.